Folk Art, Bottle Whimsies and Ships in Bottles have captivated imaginations and intrigued collectors since they first appeared. We find them prominently displayed on mantles, in bookcases, and on desks as a collection or an individual specimen. They are wonderful conversation pieces that never fail to raise the question, “How did they put this in a bottle?” They have proven to be a strong investment over time and the outlook for increasing values and collectability looks very bright and growing stronger. While some art forms have been around for thousands of years, the first bottle whimsies did not appear until translucent glass bottles and containers were developed and generally available to the public. The earliest clear bottles were very rare, expensive, and prized possessions. In time and as they became more available, it is not surprising that craftsmen found these bottles to be excellent containers for their creations. They learned how to carve their folk art into small pieces that would fit through the small neck of the bottle so that they could be reassembled inside. The artists loved the challenge and were soon building nearly anything that could be imagined inside the container using homemade tools and learned techniques. Common among the items crafted were chairs and other furniture, fans, reels, niddy-noddies, winders, religious scenes, patriotic themes, scenes with people and animals, clipper ships and other nautical dioramas, to name a few. To complete the bottle and protect its contents, amazing and intricate stoppers were developed, often with cross pieces going through the wooden stopper inside the bottle making it impossible to remove. 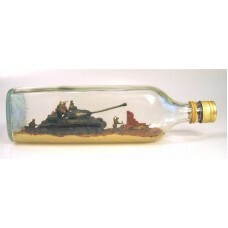 The custom stands on which the bottles rest are often works of art themselves. This 131 year old signed and dated folk art bottle was made in 1886 by A. Liberoth and it contains a.. Folk art chair in the bottle signed by artist and dated. This little wood chair with a woven seat wa.. This is an exceptionally detailed and well made scene of the crucifixion. 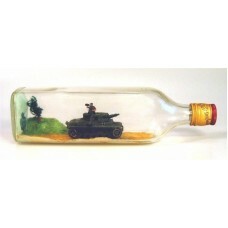 Inside the bottle is.. 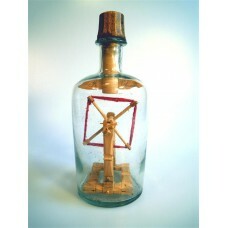 This 116 year old bottle was built in 1902 and contains a large cross and numerous religious symbols.. This extraordinary crucifixion scene shows a wonderfully carved figure of Jesus hanging on the cross.. 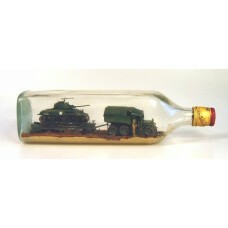 This is a wonderful model of the "Josef Stalin Mk II" Russian military tank built in a John Walker &.. This is a great model of a German PzKpfw III Tank, the Panzerkampfwagen III, more commonly ref.. This is an amazing model of a 6 x 4 Scammell R100 Tractor pulling a M4 A1 Sherman tank on a Rodgers .. This is a turn of the 20th century Listerine bottle containing three crosses and many religious symb.. This is a scene of the crucifixion with multiple religious symbols. The figure of Jesus is fro.. This is a very interestingly conceived scene of Jesus hanging at the cross with 4 sentries on each s.. This is a very well-made crucifixion scene with hand carved wooden pieces and the figure of Jesus fr.. This highly decorated and beautiful depiction of the cross of Jesus with numerous religious symbols .. This is a very well-made bucksaw built in a 1930's Duraglas druggist bottle. The bucksaw is in.. This is a fantastic huge model of a two story log cabin built inside a 1500 watt light bulb by ..